1. 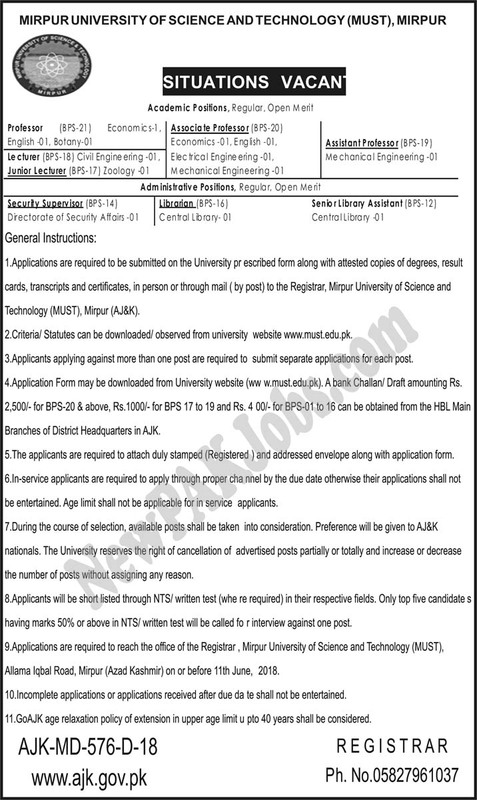 Applications are required to be submitted on the University prescribed form along with attested copies of degrees, result cards, transcripts and certificates, in person or through mail ( by post) to the Registrar, Mirpur University of Science and Technology (MUST), Mirpur (AJ&K). 3.Applicants applying against more than one post are required to submit separate applications for each post. 4.Application Form may be downloaded from University website (www.must.edu.pk). A bank Challan/ Draft amounting Rs.2,500/-- for BPS-20 & above, Rs.1000/- for BPS 17 to 19 and Rs. 4 00/- for BPS-01 to 16 can be obtained from the HBL Main Branches of District Headquarters in AJK. 5.The applicants are required to attach duly stamped (Registered ) and addressed envelope along with application form. Gin-service applicants are required to apply through proper channel by the due date otherwise their applications shall not be entertained. Age limit shall not be applicable for in service applicants. 7. During the course of selection, available posts shall be taken into consideration. Preference will be given to AJ&K nationals. The University reserves the right of cancellation of advertised posts partially or totally and increases or decreases the number of posts without assigning any reason. 8. Applicants will be short listed through NTSI written test (whe re required) in their respective fields. Only top five candidate 5 having marks 50% or above in NTS/ written test will be called to r interview against one post. 9. Applications are required to reach the office of the Registrar Mirpur University of Science and Technology (MUST), Allama Iqbal Road, Mirpur (Azad Kashmir) on or before 11th June, 2018. 10. Incomplete applications or applications received after due da te shall not be entertained. 11.AJK age relaxation policy of extension in upper age limit up to 40 years shall be considered.